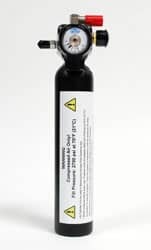 Refillable, compressed air canister with pressure gauge. For use with all BCA Float avalanche airbags. The Bca canisters are easy to plug into and out of your float pack, for install or refill. and either a skishop that is set up as a refill or dive shop, or even ice cream shop can sometimes refill it, takes no time at all, and then boom your back in business ready for the shred day!